When he arrived in California from Amsterdam after WWII, sculptor Jan Jaspers-Fayer took a job in a glass factory. At the time, it helped pay the bills for his growing family. 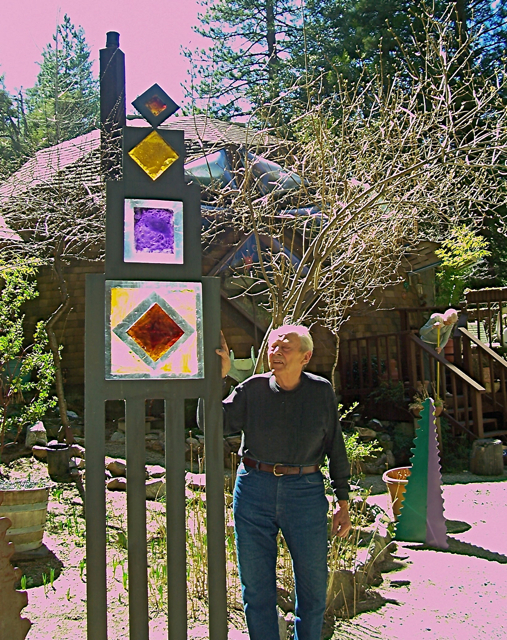 Later, the thick glass that he worked with made its way into his steel sculptures that adorn his steep back yard in Idyllwild. 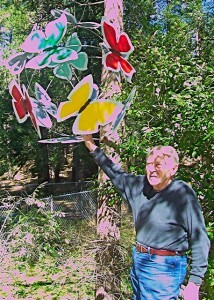 In the spring and summer, garden clubs, schools and other groups enjoy touring his Idyllwild Sculpture Garden. Many of the sculptures featured in the garden are his older works, such as the old man, that measures 12 feet high and is made from forged steel. It must be 15 years old now, but just as beautiful as the day it was cut from the same steel plate. “There’s no title, just an old man,” said Jaspers-Fayer, 82. In the back of his sculpture garden, a large steel-and-glass sculpture catches the sunlight and reflects a prism of colors onto the ground. 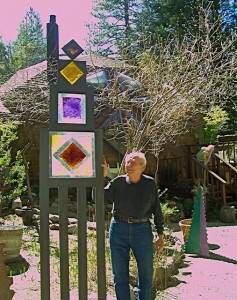 Over the years, Jaspers-Fayer has created many stained-glass images with diachronic glass, including one at the Episcopal Church in Idyllwild. However, the new sculptural creation that he’s excited about doesn’t have any glass in it at all. It’s a large wire sphere made up of interconnecting images. His artist’s prototype hanging from a large oak tree in his backyard is comprised of 12 butterflies. The sphere has about a 15-inch radius. Other art sphere themes that he’s working on include: acrobats, flowers, and birds. 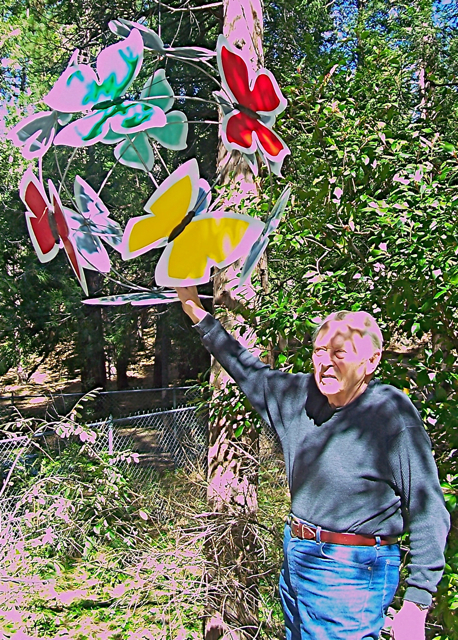 Since he lives among nature in Idyllwild, Jaspers-Fayer often draws from nature for many of his sculptures, paintings and prints that decorate his home and area galleries. To make the spheres, Jaspers-Fayer first draws the image out by hand on cardstock. He then cuts them out and tapes them together. After close inspection, he’s ready to move from cardboard to making the metal spheres. The pieces are cut out of a sheet of metal with an electric saw and then powder-coated paint is applied for long-lasting durability. Jaspers-Fayer said that he previously painted them with acrylic paint, but found that powder coating (which chemically bonds paint to metal) had more vibrant colors that worked best for his images. Jaspers-Fayer said that his art spheres are also easy to disassemble and transport. “They arrive in pieces, but anyone can put them together with a screwdriver,” he said. Sphere prices range from $1800 on up, depending upon the size. Already several are on back order, and more came after his May show at Honey Bunns and Joe Bakery in Idyllwild. 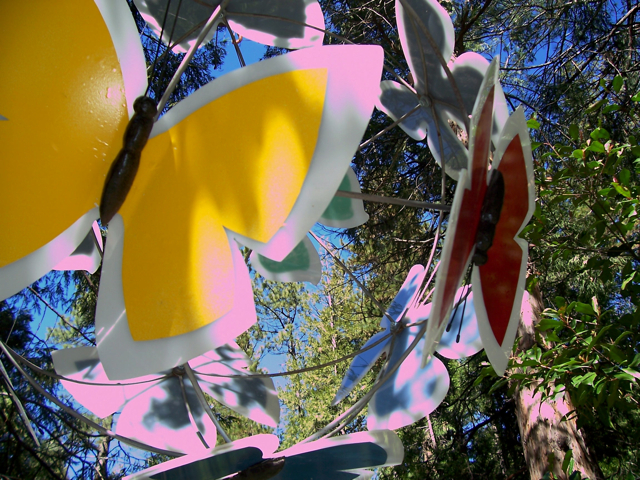 For more information on Jaspers-Fayer’s artwork or for a free group tour of his Idyllwild Sculpture Garden, call (951) 659-5240 or visit idyllwildartandsculpturegarden.com.